I was in the Kremlin with our group today on the Russia extension. While there I kept seeing rather large groups of tourists come and go, often in numbers of 50 and more. I thought of our lovely little group of 16 from TourMagination, and the wonderful group of 33 or so that preceded it from the Ukraine portion of this trip. It made me think that one should not go on a TourMagination tour if you’re the type that likes it best when lost in a crowd. But if you like a small community experience, one in which you will quickly develop friendships and shared memories, then TourMagination might just be the ticket for you. I’m not sure if this is the last blog for this Russian extension but it is getting close. First the weather: we had a glorious fall day in Moscow today, with warm weather and a mix of sun and cloud. Apparently 4 straight days of rain are on the horizon, but nothing that will affect us. 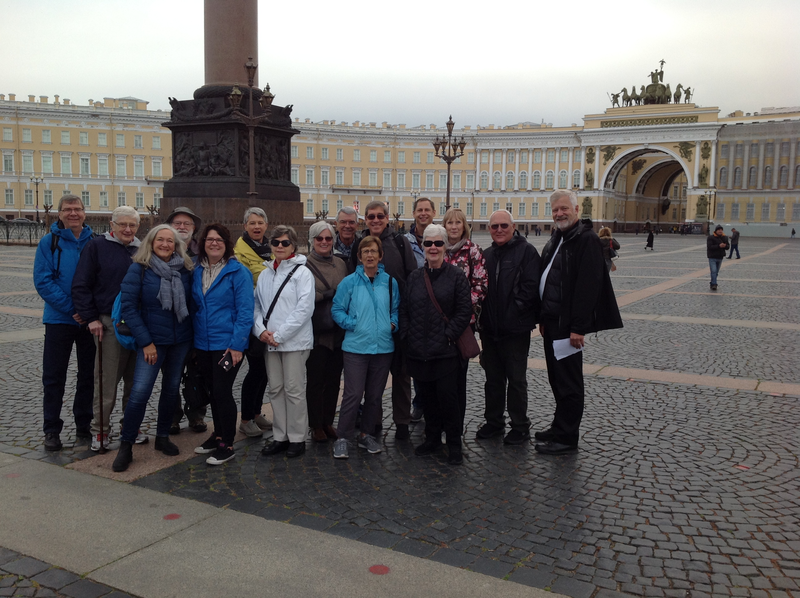 We set out after breakfast today for a tour of the Kremlin, and its ancient cathedrals. There was the usual stops at the massive Tsar cannon which never could fire, and the even more massive Tsarina bell which never could ring. But the highlight for me was the time spent with our little group in the Cathedral of the Assumption. Once again we were fortunate to have Lana Maximova as our guide, and she really is terrific. Lana helped us to unpack the majesty of this cathedral, and to see in its countless icons a transcendent meaning, beauty and depth that is timeless. We then toured the Armoury and its rich array of Muscovite carriages, crowns, thrones and Faberge eggs. After that we were on our own. We had lunch at Okhotnii Riad, in the shadow of the Kremlin, and then set off on a walking tour of Red Square, the GUM (you’ll have to come to Moscow on the next tour to know what this is! ), the Lybianka (former KGB) headquarters, the Bolshoi Theatre, and all of this just scratches the surface. At last, on the way home to our hotel, we toured about 6 of Moscow’s famed marble-plated subway (Metro) stations, with pride of place going to Mayakovskaya, Ploshchad Revoliutsii, and maybe Kievskaya. But they were all gems. It is now evening and we are about to have our final meal in Russia. If you travelled with us to Ukraine in 2018 please know that we will raise a glass to you and to the time we shared there. But we will also surely toast our Russian adventure this evening, and to the ties that will bind long after this tour comes to an end tomorrow. Glad to hear that you were going to raise a toast to those of us who joined you on the Ukrainian tour but had to forego the Russian extension!! Sounds wonderful, though. Hopefully someday we will also get to Russia! The Franz sisters had a wonderful time with our former Siberian (now Munich-ite) relatives at Oktoberfest, Marienplatz, Herrenchiemsee and Poing. Greetings to all! Hope everyone made it home safe and sound. Bernie and I stayed a bit longer in Odessa and saw a beautiful ballet, even better than the mad dream we saw in Kiev. And on our last evening, a free concert in the park. We too look around for tour members. It was a wonderful time together, wish we’d had more time.